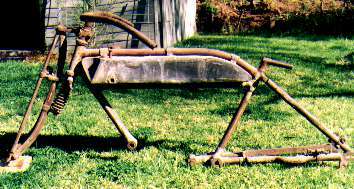 There is no shortage of mysteries when dealing with Australian motorcycles. It is quite possible to have a complete, original motorcycle and yet have no idea who put it together! Scanning old registration records, for example, shows large numbers of bikes registered simply as "JAP", yet there were scores of manufacturers responsible for assembling the things. Perhaps someone can help solve the following mysteries. Email comments most welcome. This frame is interesting because of the name "Victor" written on the side of the petrol tank. Even though the tank has been remade at some stage, it's just possible the name was the one from the original. Since Taylor's in Adelaide used the "Victor" name, the frame could be local, but I don't think so: it's quite unlike most local bikes and is probably British. Give aways must be the drop-down mounts for the rear stand, the BSA-style twin tubes coming back from the pedal bracket, and the slots for the rear wheel mount. 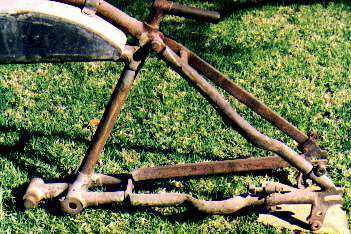 I think the front forks may not be the originals. Calthorpe had a similar frame in the veteran years. A 3 1/2 Precision bolts straight in. Any ideas? Here is another frame that was supposed to be Australian (a Regnis, like the one in the Photo Gallery), but I suspect it is British. It looks a bit like Lea Francis, although I have never seen one with both the brace to the top of the steering head and the angled tank. 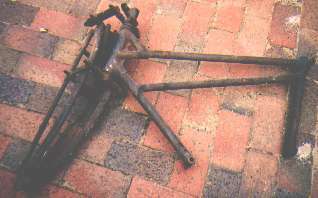 Only a few Australian bikes used Brampton Biflex forks. Any ideas?